Born December 30, 1887 in Pittsburgh, Pennsylvania. 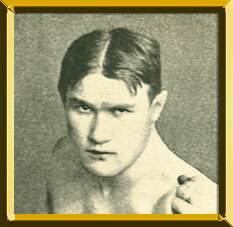 Under the management of George Engel, he began boxing in 1904. Short and stocky, Klaus was an aggressive, two-fisted battler who possessed an incredible ability to absorb punishment, yet still come back to hurt his foe. Klaus met the top men in the middleweight division, engaging in “no decision” bouts with Hugo Kelly, Billy Papke, Harry Lewis, Stanley Ketchel, and Cylcone Johnny Thompson among others. Wins over Jack (Twin) Sullivan (W 12), Jimmy Gardner (W 12), and Leo Houck (W 12) propelled him to a vacant middleweight title bout (recognized in Europe) with Georges Carpentier in Diepe, France on June 24, 1912. Klaus won via foul in the 19th round when the Frenchman's manager stepped in the ring to save his charge from absorbing more damaging blows. On March 5, 1913 he won universal acceptance as champion when he defeated recognized champion Papke in Paris via foul in the 15th round. Seven months later Klaus lost the title in an upset loss to George Chip (KO by 6). Unsuccessful in the rematch later that year, Klaus would be inactive from 1913 until boxing Harry Greb in a 1918 “no decision” bout. He retired with a pro ledger of 51-4-2, 33 NDs (27 KOs). In retirement Klaus was active in the hotel business. He died in Pittsburgh on February 8, 1948.